INTRODUCTION: "The Tide Lords" which is one of the most "twisty" and ultimately daring and stunning fantasy series in recent times, has reached the third volume on US shores. I was so impressed by the first volume "The Immortal Prince" that I ordered the already published Aussie editions of books 2-4 and read them some 18 months ago, but together with Mihir who is also a big time fan of the series, I am reviewing each installment as it gets published here in the USA. This time we mix it, so the following comes from both of us without any particular attribution. For a detailed overview of the series you can check our reviews of the first two books, but here is a short reminder of the setup: on the planet of Amyrantha civilizations fall in cataclysmic events millenniums apart and stories say that is due to the conflict of powerful immortals called the Tide Lords who are all but human - including the capability of having children with regular mortals - except for their immortality and their magical abilities that wax and wane with some kind of cosmic tide. When the series starts, the cosmic tide has been at its lowest for many centuries, so the Tide Lords are dismissed by many as legends, though of course the first novel ends with the Tide rising and the Tide Lords starting to come out of their "hiding" personae. FORMAT/CLASSIFICATION: "The Palace of Impossible Dreams" (US hc edition) stands at about 460 pages while the Australian mmpb edition, both Mihir and myself have read stands at about 580 pages. As with the previous installments there is a prologue set in the past and featuring some Tide Lords' nefarious doings and the ordinary mortals who tried to resist them, as well as an epilogue that presages the stunning tetralogy ending The Chaos Crystal. There are two superb maps of each of Amyrantha's hemispheres. The chapters are all from the third person perspective and feature as POV's: Stellan, Cayal, Arkady, Declan, Tiji, Warlock, Jaxyn, Lukys, while the story picks up immediately after the events at the end of "The Gods of Amyrantha". Arkady is aboard a ship towards Senestra though not of her own accord. She is trying hard to survive being a pawn in the long-going dispute between the self-righteous Brynden and her lover Cayal. Declan Hawkes is stunned at his recent elevation and now has to figure what he's going to do with all the power at his disposal. Stellan Desean, who became Declan's unexpected companion, has a royal personage with him and wants to survive politically and turn the tables on his former lover Jaxyn. Tiji who thought she had been kidnapped finds out that her captivity is not factual and also learns more about her own kind, while Cayal finally meets with Pellys and Lukys and then hatches a plan to get his desired wish that propelled a lot of the action in the first volume. ANALYSIS: "The Palace of Impossible Dreams" begins with quite a few plots going. Jennifer Fallon has to be commended as she has a rather acute sense of how to keep the reader tense and wary for the littlest clue. She constantly switches the POVs in her chapters and has the reader guessing as to where the plot is turning. Now after two books the reader will have a semblance of what is actually going on and what all the immortals are actually after. In this case it is an object known as the Chaos Crystal which apparently is the root of immortality and the power of the Tide Lords. "The Immortal Prince" was in many ways a Cayal and Arkady novel and "The Gods of Amyrantha" started the Tide Lords full re-apparition, but here the plot thickens and we get the first glimmers of where the series is truly going. While the old favorites Arkady and Cayal still have powerful roles, this book is truly an ensemble effort as the cast goes, while geographically the series extends to cover more and more of Amyrantha. The pace of the book is unrelenting and you *have* to turn the pages to see what happens, while the continual switching of pov's is superbly handled, so you never feel a lack of balance. 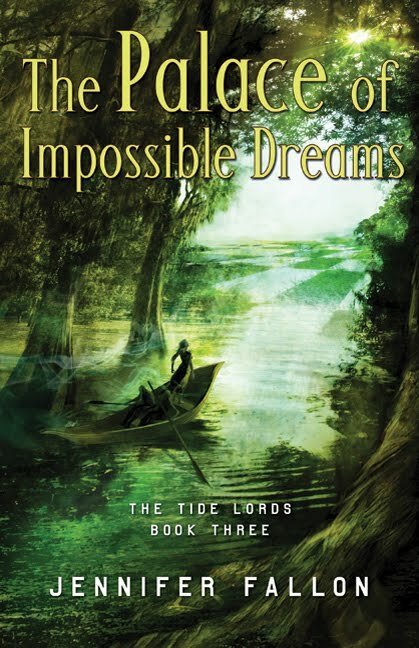 The twists and turns keep coming, alliances are formed and broken, power jostling is ongoing and the Tide is still going higher since as the uber-immortal Lukys notes, after such a long low tide, there usually comes the ultimate one in a million years "king-tide". As with the previous novels, some of the most poignant moments are given by the past stories of the immortals. The series proceeds seemingly naturally from one scene to another, however looking back from the beginning of the first volume, the change in focus and the expansion of the storyline is quite visible and on every reread of the books I am still amazed how well the author pulls it off so looked from a distance "The Palace of Impossible Dreams" could be said to belong to a different series - though again it just flows from the previous volumes. The only niggle about the novel is that it truly begs the next volume since the tension is raised so much and the plot-lines are ready to "explode" that not having Chaos Crystal to read asap can lead to frustration. "The Palace of Impossible Dreams" is epic fantasy of the highest level. Heard many good things about this series. I will wait for the final volume to come out in the US to give this a shot, hopefully it won't be too long from now.